Gove has indicated that he has no stomach for a fight. He has backed down in the face of sustained and escalating protest. It was left to his spin doctor Henry deZoete to throw in the towel, conceding the central point made by the parents’ campaign: Snaresbrook Primary School does not need academy status to improve. 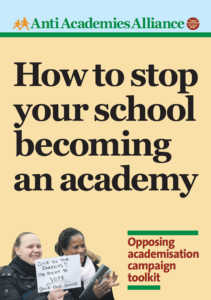 “Our policy remains unchanged – we cannot stand by when a school is judged inadequate and believe that becoming an academy with the support of a strong sponsor is the best way to ensure rapid and sustained improvement. “Snaresbrook Primary School does not have a history of underperformance and has made significant progress after being judged to require special measures by Ofsted in June. We therefore do not plan to intervene to convert Snaresbrook to an academy. But if Snaresbrook does not need academy status, no school does. It is true that there were some temporary problems, but the school leadership, local authority and the wider community had already begun to address them. Academy conversion was an unwelcome distraction. It was also clearly politically motivated. It felt like outsiders imposing a centralised, politicised solution. The Snaresbrook parents got advice from Downhills and held firm. The whole school community was united. Crucially the Local Authority, including Tory councillors, opposed the conversion. A school improvement plan was already in place with a new head and support from the LA. Although, the governors looked like they might cave in to the pressure, the parents campaign gave them enough ‘backbone’ to stand up to DfE bully boy tactics. The victory at Snaresbrook comes a week after a leak from the DfE revealed that officials had advised Gove to ditch the forced academy programme due to cost and political pressures in the wake of the Downhills campaign. Snaresbrook was on the verge of breaking into national news with a petition handed into Downing St this week and a planned lobby of Gove on Friday 1st November (now cancelled). So it is no surprise Gove has sued for peace. It is an indication of his weakening position. Free school scandals have tarnished his flagship, splits in the Coalition reveal a lack of popularity and, most importantly, professional opinion is hardening against his reforms. Gove cuts an increasingly isolated and despised figure in education, despite his ‘poster boy’ status on the hard right of the Tory party. Even Lord Baker has spoken out against him. For all these reasons, Snaresbrook is an important victory. It shows Downhills, Roke, Gladstone Park and others did not fight in vain. 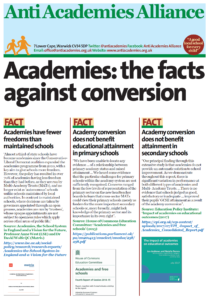 It confirms that no school ‘needs’ academy conversion. It shows that any school that finds it itself in trouble can work with their community to improve. The AAA hopes that Gove will now publicly admit that the policy of forcing academy status on schools is finished. For now, DeZoete may claim the policy is unchanged, but we all know the policy can be defeated. 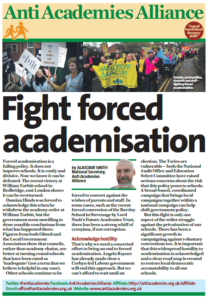 This entry was posted in Blog, News, Top story and tagged Forced academisation, Gove, Parents, Primary, Rejecting Academy. Bookmark the permalink. I am a parent that continues to fight for justice because the Academy’s policy eradicated every last ounce of justice and equality for us with the consent and collusion of the Dfe. The school in question, like many Academy’s, is hugely over resourced in every way and yet all but fails Ofsted (4 visits in under 2 years) and remains undersubscribed in an area of massive over subscription across neighbouring catchment schools. Yet still Dfe makes excuses, Gove has no comment, the school on the other hand make great play of the few high points in their recent Ofsted and is allowed to deny all identified wrong doing. When questioned Ofsted say they have no power to challenge or redress this! When the veneer of Academy and Free Schools becomes so tarnished what will be the next imposed reform? The funding that has been poured into this project could fund more teachers, improved facilities for all schools, subsidise transport for all, the list is endless. Let’s face it correct funding, staffing, support and performance management with proper inclusion of the parents and students would make it impossible for a school to fail to perform! Teachers are not hard done by and need to take control of their profession like the professionals that they are. Note to all – this victory at Snaresbrook Primary School came about because everyone united against Gove and the Dfe bully boy machine! To all of the teachers reading this please learn the lessons: Work with your parents, students and governors equally and you can stop the madness that is Gove’s eradication of all of our rights and ensure that standards are universally improved and that everyone can feel valued whatever their academic success looks like. We cannot trust any of the politicians to stand by their promises but we can all work together to reverse the trend.